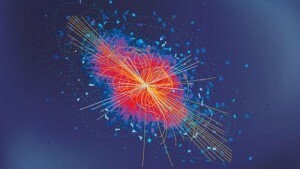 Popular science loves to portray the big bang this way. It was even portrayed this way in the new Cosmos series. The only problem is that isn’t how the universe began, and portraying it this way raises all sorts of misconceptions. In reality, there was no outside darkness into which the big bang appeared. 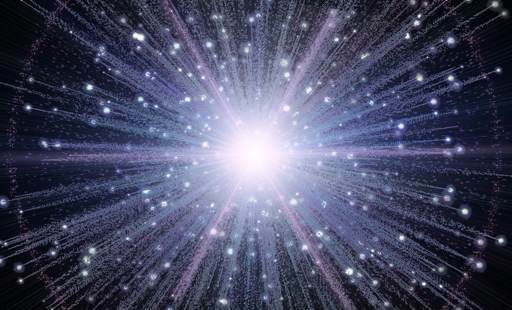 The big bang didn’t begin at a point in space and time, it was space and time. If you want an accurate picture of the big bang, it shouldn’t be from the outside looking in. It should be from within the big bang itself. If we could travel backward in time, we would see a universe where galaxies rush together. The background temperature of the Universe would increase as it contracted. The stars would fade and evaporate into primordial gas. The galaxies would dissipate into hydrogen and helium gas. For a while the universe would be dark. Eventually the temperature and density of the universe would be high enough that it would visibly glow with its own internal heat. In every direction we would see a glow of light. The light would grow brighter as the temperature rises. It would soon reach a temperature of about 3000K, or about the temperature of the surface of a red dwarf star. Except the light and heat would be in all directions. Everywhere you looked you would see a bright reddish glow. You would be surrounded by a gas of hydrogen and helium. At this point the universe would be only about 380,000 years old. The idea of traveling backward in time sounds like science fiction, and in a way it is. But that bright reddish glow can still be seen today. As the universe expanded the glow has faded and cooled, so that now it is a dim background of microwaves. But it is still there. It is an image as close to the big bang as we can directly observe. The big bang didn’t begin at a point, it began everywhere. Based on Newton law of motions and Albert Einstein law of relativity that energy can be converted matter and vice versa.So the question is that since big bang, does it mean that mass of regular matters are the same. That means that what we have been seen is that energy is been converted to matters and vice versa. How does one illustrate a Universe without time? You could say the point illustration is an illustration of time rather than light. Here in the darkness there be no time and here in the light time has just begun. The problem seems to be that space time is often conflated with darkness and nothingness.